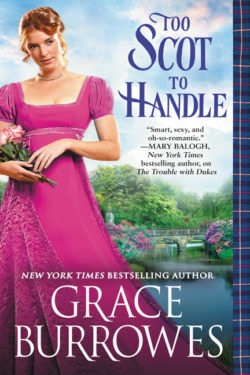 TOO SCOT TO HANDLE is the second book in The Windham Brides series, a stand alone book which can be read and enjoyed without having read the first in the series. Colin MacHugh was a captain in the army where he was a leader and looked up to by his men. He had a mechanical knack and could fix just about anything. As a titled gentleman he is a much sought after bachelor. The endless parade of debutantes keeps him out of the ball rooms. Unsure of how to act in English society he asks a lord who had served with him in the army to help him to blend into society. The friend is on the board of an orphanage, and entices Colin to join in the running of the orphanage because working with a charity is a good thing for a Lord to be involved with. Through Colin’s service to the orphanage he meets demure Miss Anwen Windham, who proves to be anything but demure once he gets to know her. She fights for her boys, the orphans, trying to keep a roof over their heads, and food in their stomachs. Anwen is impressed with Lord Colin, and the way he involves himself with the rambunctious orphan boys. Colin is the first man to actually listen to Anwen’s ideas. She finds herself falling in love with the handsome Scott and welcomes the heat of his touch. There are enemies about trying to undermine the orphanage, and discredit Colin. He has enemies who will stop at nothing to ruin him and anybody he holds dear. And when Anwen’s Aunt holds a charity card party where both money and jewels are collected for the orphanage, only to be stolen the same night, Colin is accused by the very ‘friend’ who had encouraged him to join the board of the orphanage. With the help of Anwen’s boys, Colin embarks on a dangerous mission and the mystery is solved and the orphanage is saved. Colin and Anwen’s romance heats up the pages. A slow start, but sizzling hot by the end! Wonderful read!! Pick up your copy of TOO SCOT TO HANDLE today!